Players wore a red shamrock on the back of their jerseys during the Lory Meagher Cup final. John Paul McGarry lifts the Lory Meagher Cup for Fermanagh. 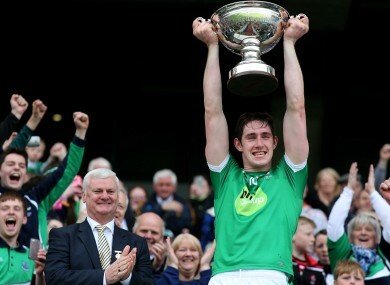 SHANE MULHOLLAND WAS described as Fermanagh’s ’16th man’ at Croke Park during last Saturday’s Lory Meagher Cup final. Former Erne County hurler Mulholland was tragically killed in a car accident last April, just days before his first wedding anniversary. But the memory of the late father-of-one was uppermost in the minds of Fermanagh’s players during their victory over Sligo. Fermanagh finished the game with 12 men but still managed to claim the silverware, scoring a 3-16 to 1-17 victory over Sligo. Email “The Fermanagh hurlers pay a lovely tribute to their late teammate in Croke Park”. Feedback on “The Fermanagh hurlers pay a lovely tribute to their late teammate in Croke Park”.